But thankfully I make delicious food for myself! Last week before I left town I finally tackled Monica’s buckwheat crepes and guess what! After three years and 2 crepe cakes later, I think I finally learned how to flip a crepe! God bless my cast iron skillet. The first batch of buckwheat crepes I filled with sauteed local baby portobello mushrooms (marinated in balsamic vinegar, olive oil, garlic, basil, and oregano) and garlicky kale. Unfortunately I didn’t grab a photo of this awesome, lip-smacking, so-easy-it’s-not-even-funny filling because a surprise visitor caught me cooking in my PJs and I had to rush around to finish them in time. Thankfully I was making the crepes for him, so it was fine, but I didn’t grab a photograph. The second batch I filled with cinnamon spice apples for a sweet, yet filling breakfast. I have to admit, although I wasn’t expecting it, I’m becoming a huge fan of buckwheat. I had the flour sitting around forever, used some up in the sun dried tomato and fresh herb buckwheat rolls, and then had no idea what to do with it. With gluten-free experiments on the rise I’ve found that I’m turning to the flour more often than not. The density makes it extraordinarily filling and the texture is pleasant once I’ve gotten used to it. It’s grainy. Like grains. Like flour used to be and, as I’m beginning to think, as it should be! If anyone has any favorite buckwheat recipes, send ‘em my way. Thus far I’ve only made rolls, crepes, and pancakes, but there’s got to be more out there! Whisk together all of the ingredients Let the batter rest for at least an hour. Lightly oil an 8- or 10-inch nonstick skillet (CP note: after years of trying various nonstick pans, crepe-specific and non, I’ve found that my cast iron skillet works like magic) and place over medium heat. Stack the crepes on a plate as you make them. You can keep them warm in a low oven while you make the remaining crepes. Or freeze the leftover crepes, separating each crepes with a piece of parchment paper. In a nonstick (or cast iron) skillet over medium heat, warm the olive oil. Add the apples, cinnamon, and sugar. Stir to combine. Cook for 5-10 minutes, until the apples begin to soften and get juicy and the sugar begins to caramelize. Remove from heat, then fill the crepes. I too just recently found out I love buckwheat – awesome gluten-free grain! I’ve traveled to hundreds of cities in more than 40 countries…and I’ve got to say that Houston IS one of the worst. Ughghg. Austin, on the other hand, is one of the BEST. Definitely try to make it there one of these days. On a happier note – those crepes look amazing! Nice job! I am ashamed to admit that I have never made crepes. i too love the texture of buckwheat, and brown rice flour, too. i can’t get enough of these gluten-free recipes, Jes! i’ve got your pumpkin brownies lined up to make as soon as i grab a pumpkin or two at the farmer’s market. i’m gonna have to make these crepes as well. garlicky kale + mushrooms = one of my favorite combinations (especially when you add a touch of maple syrup and sweet potato to it all.)! gonna give them a whirl with the spice apples as well – there are tons of apples at the market these days. mmmmmm! sorry houston wasn’t the greatest. be sure to visit austin some day (it kinda reminds me of richmond, actually) – it’s awesome. 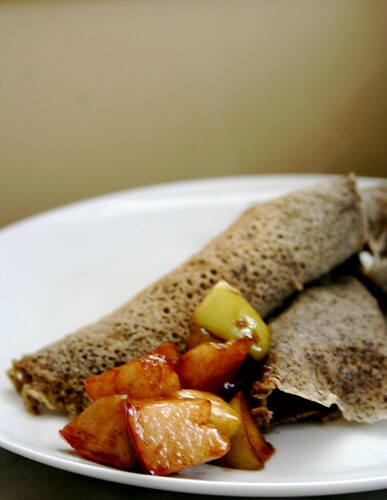 I love buckwheat flour and apples and cinnamon so these pretty crepes will be on the menu next week! Lovely photo!!! I haven’t had the best of luck using buckwheat thus far, but I’d love to give it another try with this recipe… The results sure do look promising! Oh yum, I must make those one day. I usually grind my own buckwheat flour and love,love, love the flavour.